Eating Up Easter, the debut feature from director Sergio M. Rapu, will make its Easter Island premiere on March 15 at 7:30PM at the Toki Rapa Nui School for Music and Arts. 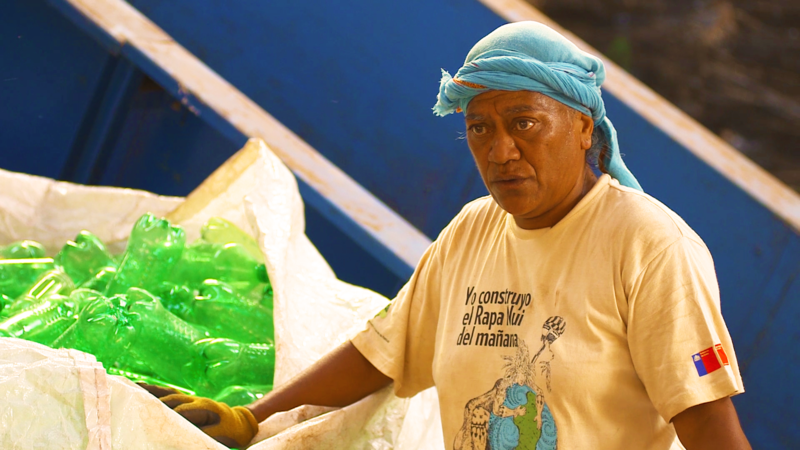 The free community screening is presented by Plastic Oceans as part of the Swim Against Plastic: Easter Island campaign, and in partnership with Kartemquin Films, Pacific Islanders in Communications, Toki Rapa Nui, Municipalidad de Rapa Nui, and Plastic Oceans Chile. Eating Up Easter (2018) | Official Trailer from Kartemquin Films on Vimeo. “The last 50 years, my island — my culture — has been used as a cautionary tale of humankind’s ability to destroy our planet. Journalists wrote about the destruction of our island, the death of our people, the demise of a great civilization. But they got it wrong. I made this film so that others would know that the Rapanui people, descendants of those ancient statue carvers, are still very much alive. Through the investigation of a story about food security on Easter Island, I realized that a much more global story was present: one about people trying to survive with limited resources on a tiny planet. “On our tiny island, we cannot hide the trash that is piling up, and we cannot afford to ignore the limited water that is at risk of being contaminated. My community’s search for answers to our social and environmental problems is really parallel to the balance we are trying to strike globally between development and sustainability. Next week, after seven years spent making this film, I will hop on a plane and travel back to Easter Island to show it to my community. It will be frightening, to show the film in front of 8,000 of my closest critics. But with our success on the festival circuit as well as the upcoming broadcast on Independent Lens, it is empowering to know that the Rapanui story is finally being told and the world is listening." – Director Sergio M. Rapu in Realscreen. Learn more about the film at eatingupeaster.com.